This bestselling text is a comprehensive overview of functionalist approaches to translation in English. 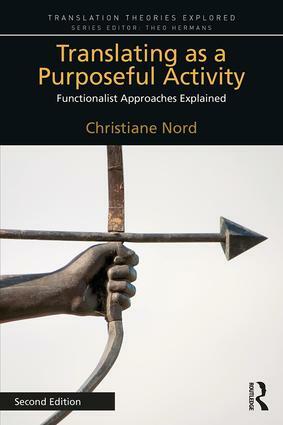 Christiane Nord, one of the leading figures in translation studies, explains the complexities of theories and terms in simple language with numerous examples. Covering how the theories developed, illustrations of the main ideas, and specific applications to translator training, literary translation, interpreting and ethics, Translating as a Purposeful Activity concludes with a concise review of both criticisms and perspectives for the future. Now with a Foreword by Georges Bastin and a new chapter covering the recent developments and elaborations of the theory, this is an essential text for students of translation studies and for translator training.